Make a refreshing, uplifting, difference through service! Live Music, Peruvian Food & 80+ Volunteer Cake plus Utah's Most Affordable Silent Auction! Awards and Inspiring KeyNote Speakers! America First Credit Union, American Express Community Development Center, Angmar Inc., Art Access, First United Methodist Church, First United Korean Methodist Church, George S. & Delores Dore Eccles Foundation, Kennecott Foundation, Kolschowsky Foundation, LDS Charities, Marion D. & Maxine C. Hanks Foundation, Mt Tabor Lutheran Church, Smith’s Food & Drug Stores Inc., and Thrivent Financial. Keynote Speakers: Dr. Mia McNulty, CEO, Nia Imani Foundation & Founding Family Church Member Riverside Lutheran Church (ELCA), Los Angelos, CA; Hyoyoung Park, University of Utah, Graduating Senior, 6/2018. Raised $12,900.00 while having a delicious afternoon of international music and conversation. Monies support refugee, economic immigrant and first generation ministries. Eno Enobong Etuk, LDS & Director of inter-faith Green Waters Health Center, Joan Lorena Frear with her granddaughters McKenzie, Cassidy and Madison, for her hospitality and reception work daily with refugees and immigrants; Ms. Maysa Malas-Kergaye, Muslim Speakers Bureau/Salt Lake Inter-Faith Round Table; Dr. Mia McNulty, CEO, ELCA Lutheran/Nia Imani Heart Association, LA, California; Agnes Nduwimana, for her groundbreaking work beginning the Khurundi-speaking Bhurundi Pentecostal Christian Church in Salt Lake Valley and work with inter-faith Manna Market food distribution; Ms. Joohwa Park, Korean Methodist Church (downtown SLC) & VP with inter-faith Board of Trustees; and Ms. Wendy Stovall, Unification Church and Secretary/Photographer, Salt Lake Inter-Faith Round Table. ESL Team Teachers: Marva Bennett, Marian Hunt & Aletha Paskett - all LDS career and retired teachers; Christy & Bob Blodgett who assist refugee families in-home. Keynote Speakers: State of Utah House Representative Steve Eliason, Charlene Frail-McGeever, Molina Health Care Systems, and Hyoyoung Park, University of Utah, Student. Raised $11,100.00 while having a delicious afternoon of international music and conversations. 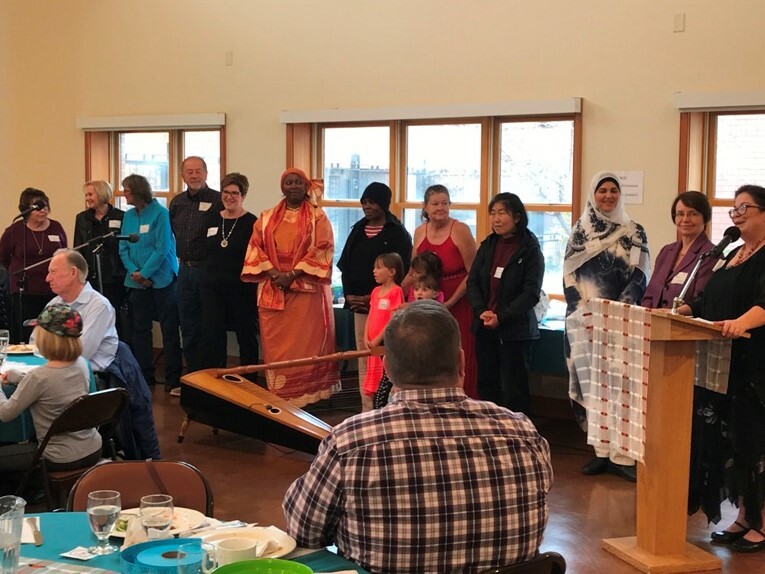 While learning about bees including Charlene's hands-on models of a beehive, raised monies Monies to support refugee, economic immigrant and first generation ministries. *AmeriCorps*VISTA members providing quality service for 3.5 year term.